New year, new game. Back in December, I mentioned that I’d be giving Final Fantasy XIV a try, with the Japanese MMO getting three months to win me over. Surprisingly, it’s managed to hold my attention in a magitek grip ever since I created a new character earlier this month. If my Twitter feed is anything to go by, I’m having a whale of a time. 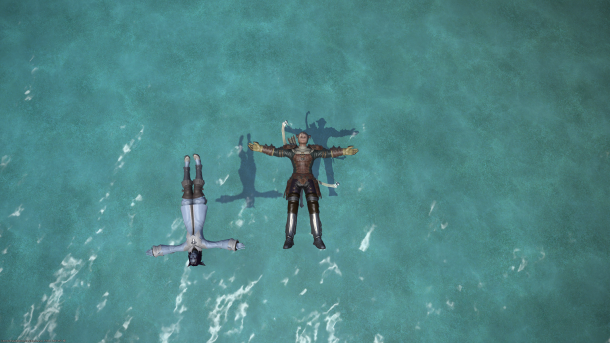 However, if I’m honest, this isn’t my first time in FFXIV. Back in the original beta, rolled a new character and ventured forth, quickly stumbling on a quest to kill ten rats. Only the rats only had three spawn points, and the spawn timer was so low that a growing crowd of players swamped them. I logged out and never looked back, passing on the game until now. That was almost ten years ago. 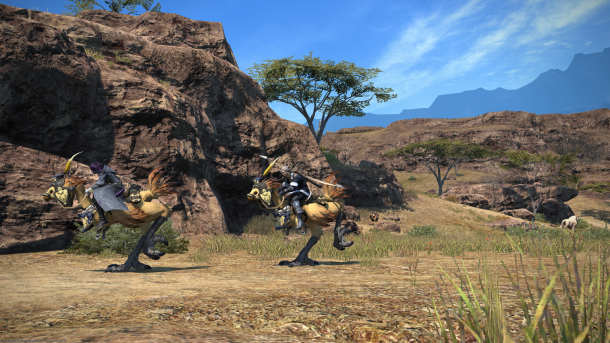 Time passes and games change, but few have gone through as much upheaval as FFXIV. I interviewed producer/director Yoshida-san back when he was preparing to relaunch the game with the subtitle A Realm Reborn, and I couldn’t help but appreciate the energy and faithful commitment he brought to the job. A few years later, the reboot was a success and his team was already working away on an expansion pack. I’d always promised that I’d give FFXIV a proper go, and even bought a boxed copy for PlayStation 4. But something else always got in the way, or trashed my plans, or caused a complication. Until this year, it always seemed not to be. Today, I feel like an idiot for putting it off for so long. 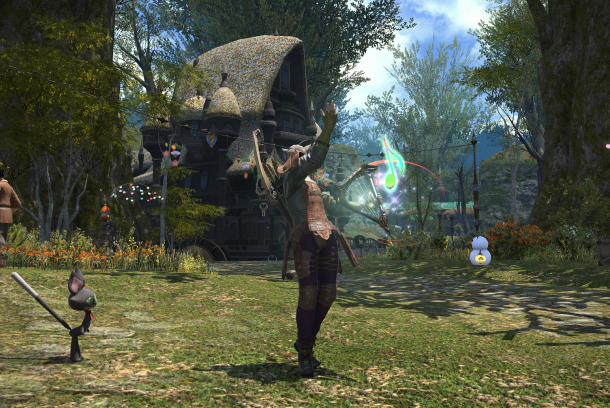 After playing for a few weeks, I’ve discovered that Final Fantasy XIV: A Realm Reborn is huge fun. So what’s changed? I’ve rolled a character on Omega – a new EU server that’s offering a ‘Road to 60’ XP boost for new characters. Add to that a few XP-boosting items, and Rested XP, and I’ve literally been chewing through the content. While there’s plenty of side quests and missions at every town and village, the boost means I’ve been able to focus purely on what’s called the ‘Main Scenario’ – a central quest chain running through the game. Throw in a hefty-portion of class-specific quests, and I’m levelling so quickly that the missions can’t keep up. Despite my late arrival, FFXIV still looks great on my new rig with everything maxed at 4K. But it’s the depth of the world that’s grabbed me, from being able to teach your chocobo combat skills, to hiring a retainer that acts as bank, auctioneer and mission runner all in one. It contains all the trappings I’d expect from a modern MMO, but gives each piece a twist, or looks at the function in a new, unusual and intriguing way. I’ve also experienced a lingering feeling of freshness, a bit like that new car smell. Maybe it’s because I’ve ignored my normal approach of rolling a grumpy old mage, or my default backup of a self-healing paladin-type. 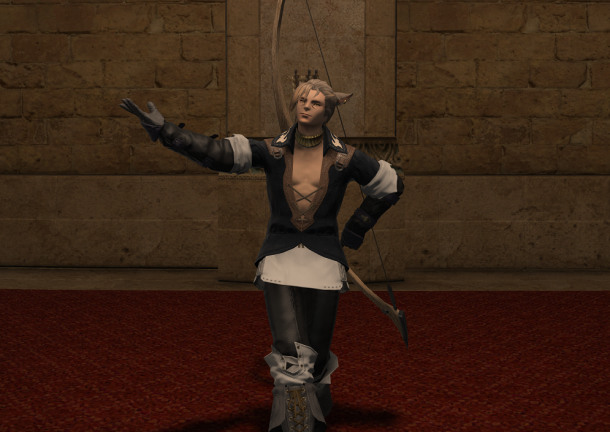 Instead, I went with a scallywag Miqo’te and started training him up as an archer. Picture him as a charming rogue, and you get the idea of G’zah Tia. The biggest shout, however, has to go to the community, who’ve been friendly and welcoming all the way through. I’ve not yet joined a guild or Free Company, but I’ve not felt the need to either. There are other nice touches, like I can swap between classes just by changing weapon, or that crafting skills are treated as classes in their own right with their own skills and levels. After levelling up my Archer, I could specialise as a Bard, and discovered that I could actually play music in-game. Maybe my adventurer will take a sideline in rock star. It’s not been a perfect experience, and I’ve done a ridiculous amount of running back and forth between the main cities around Eorzea at the behest of factions and secret societies. However, I’m told things get much better from level 50 onwards, so time will tell. Group play has also been disappointing, with FFXIV’s Main Scenario regularly insisting that I face an encounter alone. Even so, it’s been enough to persuade me to buy the expansions and go for cap. I’m not sure if Final Fantasy XIV will hold me much beyond that, and I guess it depends how much I get into endgame. 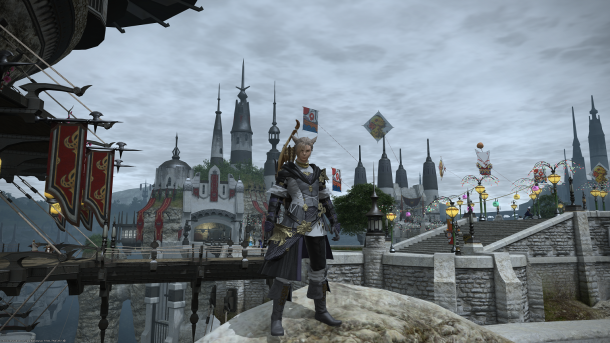 For now, a change is as good as a holiday, and my adventures in Eorzea fit the job perfectly. And perhaps – just perhaps – I’ll keep my promise. This entry was posted on Monday, January 15th, 2018 at 9:58 pm	and is filed under Final Fantasy XIV, MMO Musings. You can follow any responses to this entry through the RSS 2.0 feed. Both comments and pings are currently closed.